Most parents know that to succeed in life, kids must succeed in school. 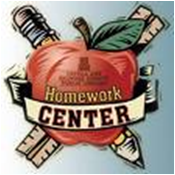 This page will provide you with some information and inspiration on creating a great learning center at home. Tips to make you child's learning experience and doing homework more pleasurable. Prepare a special place for homework. Make sure it's quiet and away from the TV and other distractions. Provide a good desk, chair and filing space. Purchase (or make) creative bulletin boards for class schedules, deadlines, etc. Create a filing system with your child so he/she knows where papers go. Kids love color and aren't afraid to play with shapes. Purchase colorful storage bins and boxes. Make their space as fun and positive as you can. Find desks that have fun shapes and appropriately sized for your child. Have reference materials on hand. A lot of information can be found on-line these days, but it never hurts to have a dictionary, maps, etc. on hand. Computers are a must for kids today. If your child has his/her own computer, make sure to have parental safeguards installed. The best advice for keeping kids safe on the Internet is . . . keep the computers out of the child's bedroom and place it in a more public space. Consider a white board calendar. They are great for homework reminders, etc. I hope this information and the pictures on this page have given you some inspiration to create a fun, colorful and creative learning environment at home. Do You Have a Great Kids Learning Center? Do you have a great kids learning center area in your home? Let others see it! Tell us about it in the box below and upload a picture. It quick and easy!